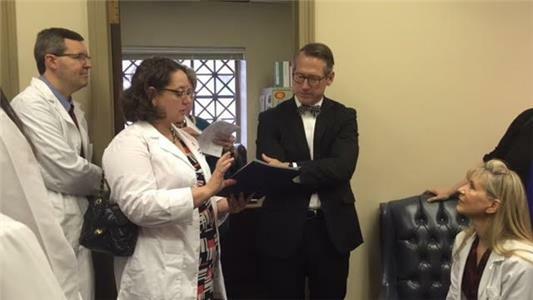 A record number of physicians and other healthcare advocates took part in the Tennessee Medical Association’s Day on the Hill on Tuesday in support of better state healthcare policies. TMA’s biggest advocacy event of the year drew more than 300 people to meet with lawmakers on Capitol Hill, far surpassing the number of participants in previous years. TMA President Keith G. Anderson, MD, said physician engagement in state policy is good for doctors and for patients. Record participation in Day on the Hill shows that physicians know how much policies made in Nashville impact their patients and practices, said TMA Legislative Chairman Ronald H. Kirkland, MD, MBA. 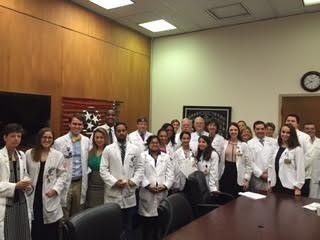 “The presence of so many physicians and healthcare advocates in the halls of the Capitol sends a powerful message to our elected representatives that Tennessee doctors are actively invested in the work they are doing,” he said. The Healthcare Provider Stability Act – SB 856/HB 1106 would limit how often insurance companies can change fee schedules and payment policies/methodologies and require more notice when such changes are made. The bill would give providers more financial predictability and stability. Prohibition of Mandatory Maintenance of Certification – SB 298/HB 413 would prohibit health insurance plan participation or payment, hospital privileges, or state medical licensure to be based solely on Maintenance of Certification status. TMA believes that maintenance of board certification should be a voluntary path for physicians to continue their medical education. Doctors should have the option of choosing relevant, affordable education content that best fits their day-to-day practice and helps them become better doctors. Peer Review for Doctors of Osteopathy – SB 369/HB 378 would restore the ability of Doctors of Osteopathy to use peer review committees to better the practice of medicine on an equal footing with Medical Doctors. It was inadvertently removed when the peer review law was revised in 2011. Patients for Fair Compensation – TMA opposes SB 744/HB 1150, which would replace the current medical malpractice liability system with an untested administrative patient compensation system for physicians only. Tort reforms in 2008 and 2010 have improved the medical liability climate in Tennessee, and the proposed system would provide no guaranteed cost savings and make Tennessee a less desirable state in which to practice medicine. Patient Cost-Sharing for Oral Anticancer Treatment – SB 922/HB 1059 would prevent out-of-pocket payments from oral cancer treatments from being higher than traditional IV treatments. Similar legislation has been enacted in 37 states and the District of Columbia with no documentation of a significant increase in premiums as a result. Such treatments are, in some cases, the only available treatment option for patients.